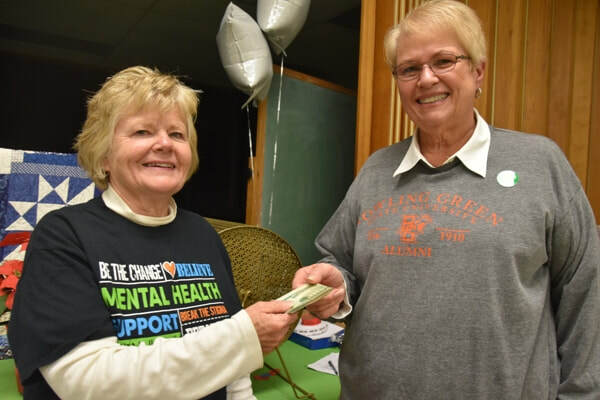 Recognized by the IRS as a 501(c)(3) public charity, NAMI Four County serves residents of Defiance, Fulton, Henry and Williams counties and is affiliated with the state and national chapters of NAMI - the "National Alliance on Mental Illness." We are a grassroots, family-oriented organization whose mission is to provide education, support and advocate for individuals and families living with mental illness as well as increase public awareness and understanding of mental health. We strive to improve the quality of life, ensure the dignity and respect for persons with a serious mental illness and to support their families. All NAMI meetings, educational programs and events are free and open to the public regardless of where you live or whether you are a NAMI member. To improve the quality of life, ensure dignity and respect for persons with serious mental illness and to support their families. In Ohio, it's one person every 5 hours. Suicide can be prevented. To learn what you can do to help, please click the Helping Someone You Care About button on the left side of this page. Youth Mental Health First Aid. An all-day Youth Mental Health First Aid training will be held Tuesday, May 7 at St. John's Christian Church, 700 S. Defiance Street (State Route 66), Archbold, starting at 8 a.m. and concluding by 4:30 p.m. This training has been underwritten in part by a grant from the Promedica Defiance Regional Hospital Foundation. This training is for persons who work or volunteer with children or teenagers as well as parents, school teachers and counselors, social service workers, clergy and youth pastors, day care centers and anyone else who wants to learn how to recognize youth who may be having a crisis that puts them at risk of suicide and then knowing how to help them get the appropriate mental health care. Participants who complete the full 8 hour training will be certified in Youth Mental Health First Aid, and 8 hours of social work CEUs are also available at no cost. Other licensed participants needing CEU should check with their board to see if social work CEUs are accepted. A 120 plus page manual is provided along with a continental breakfast and lunch. For a more detailed description of the training and a registration form, please CLICK HERE. The deadline to register is Monday, April 29 and class size is limited. If you are interested in the training, register now. 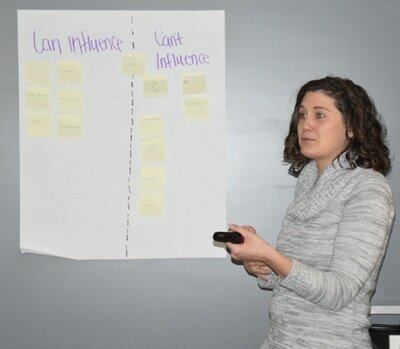 NAMI Four County once again partnered with Dr. Clarissa Barnes, director of the Defiance College Hench Autism Studies Program, to offer a 3-hour training on practical ways to discourage challenging behaviors and promote positive behavior among youth. Some 22 participants from area school systems, churches, Jobs and Family Service offices, Northwest Ohio Community Action Commission, the area's Court-Appointed Special Advocates program as well as parents and grandparents of children who have challenging behaviors attended the training on the Defiance College campus. Dr. Barnes, pictured walking among some of the participants, focuses on identifying specific challenging behaviors, the consequence that follows that behavior and what occurred before the behavior to help participants determine how specific changes in the environment could lead to the elimination of the disruptive behavior. By end of the three-hour training, participants have an action plan that they can then use with the children that they are involved with. This was the fifth year that NAMI and Dr. Barnes have partnered to offer the training, which was so popular that nearly 15 people who had hoped to attend were placed on a waiting list. We hope to offer the training again in the fall. Several of the participants gave the following comments about the training. "Great class. I left with a better understanding of some behaviors." "Very well done -- would like to know if anything like this is offered again. Will be referring families." For more photos from the training held Saturday morning, March 2, please click on the "Photo and Video Gallery" button on the left side of this page. NAMI Four County recently received a $1,300 Dream Launcher grant from the Bryan Area Foundation to purchase equipment needed for our annual spaghetti dinner fundraiser. Gary Arnos (left), who manages the preparation of the dinner, is pictured with Jack Brace, executive director of the Bryan Area Foundation, with some of the equipment that has been purchased. There are more roasters for the spaghetti sauce and kettles for the noodles, plus tables, a tent and more. Since the dinner began, Gary has spent several days beforehand picking up roasters, kettles, propane burners and such from friends and organizations and then returning everything afterward. 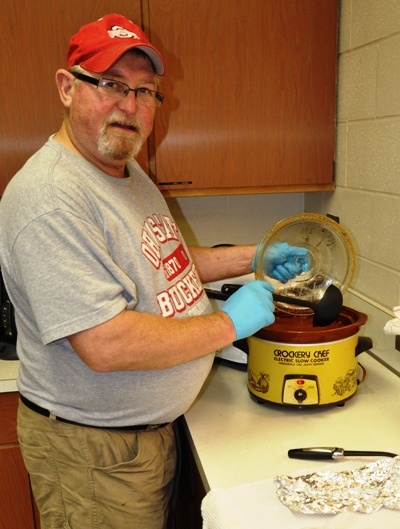 Now, the equipment is all in one spot and ready for the 2019 Spaghetti Dinner which will be held from 5 to 7 p.m. Thursday, November 7 at the Buffalo Road Banquet Hall (formerly the Knights of Columbus). Thank-you to the Bryan Area Foundation! As a new year begins, NAMI's core policy positions remain unchanged. NAMI believes innovation is vital to reduce disparities. 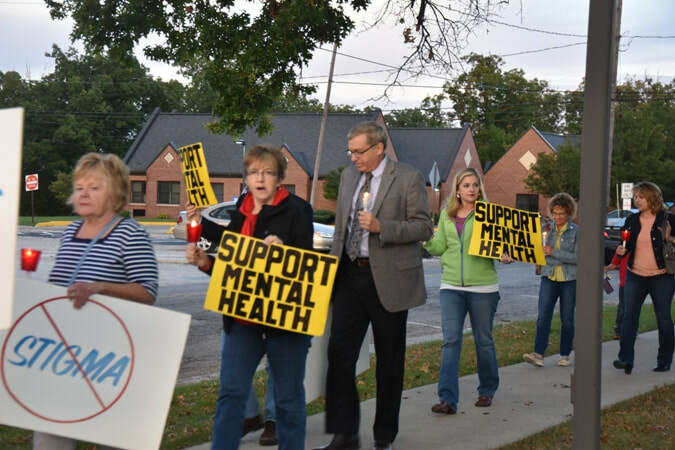 NAMI believes improving mental health care is critical to achieve better outcomes. NAMI believes supporting recovery is fundamental to reduce injustices. If you would like to stay up-to-date on legislative matters that impact mental health, you can receive updates from NAMI on Twitter. You can also check back on our NAMI Four County website and click the "Advocacy" section at the top, left side of our Home Page. Right now, you'll learn what would happen if the Affordable Care Act (often called Obamacare) was eliminated. Late last year, a federal court judge in Texas ruled it unconstitutional. 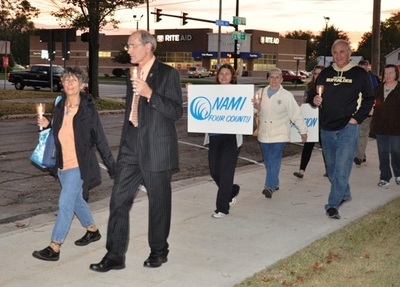 Follow NAMI on Twitter at @NAMIAdvocacy for updates. 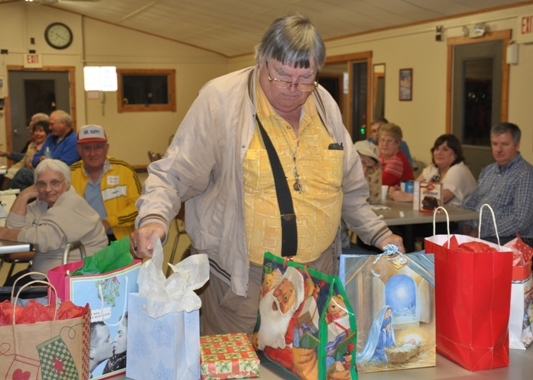 Seventeen NAMI members and friends celebrated the holidays last month at our annual Holiday potluck and party at the Scout Cabin in Archbold's Ruihley Park. For more photos from the event, click on the Photo and Video Gallery button on the left side of this page. successful! Thank-you for your support! Our 4th annual Spaghetti Dinner fund-raiser was held Thursday, November 1 in Bryan and was a tremendous success -- netting nearly $6,700. Our event sponsors, listed at the left, brought in $4,350. Donations given at the door totaled nearly $2,000. The various raffles yielded $1,079 and the winner of the 50/50 drawing -- Amy Miller -- donated her $181 in winnings back to NAMI Four County. Thank-you Amy! Again, thank-you to our event sponsors, those who donated items for the raffles and those who attended the event! The winner of the quilt raffle was Gene Schubert of Ney. Ticket sales totaled $1,053. 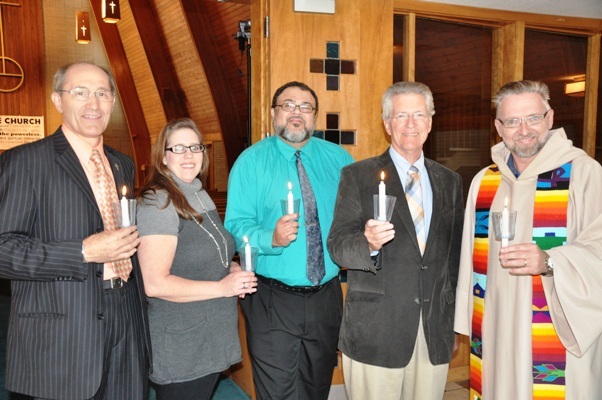 The 2018 Candlelight Vigil for Mental Health program, from left: Ron Hofacker, emcee; Pastor Max Begley, Second Baptist Church, Defiance; Bev Miller, co-owner of M.E. Miller Tire Company, Wauseon; Myrna Mitchell, NAMI member from Bryan; and Tonie Long, program director of the Four County LOSS Team. 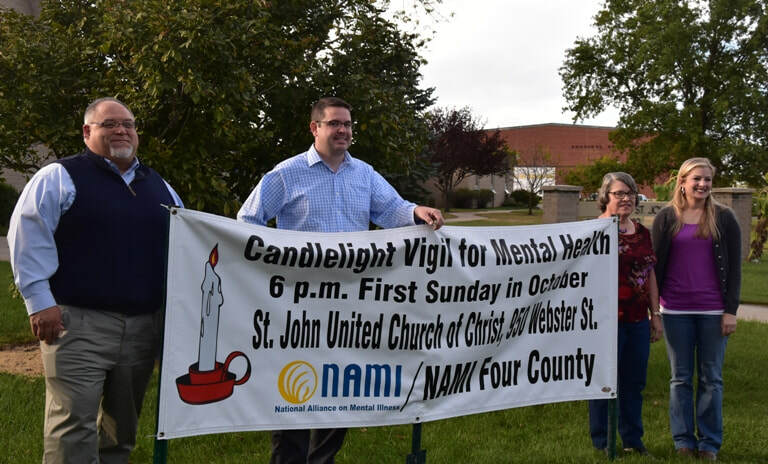 NAMI Four County held its 19th annual Candlelight Vigil for Mental Health Sunday evening, October 7 at St. John United Church of Christ in Defiance with Ron Hofacker serving as the master of ceremony as he has for 17 of the vigils. This year's speakers included Myrna Mitchell, a family member from Bryan; Bev Miller, who has lived with bipolar disorder since her early 20s and is now co-owner of M.E. Miller Tire near Wauseon; Rev. Max Begley, senior pastor at the Second Baptist Church, Defiance; and Tonie Long, program director of the Four County LOSS (Local Outreach to Survivors of Suicide) Team. 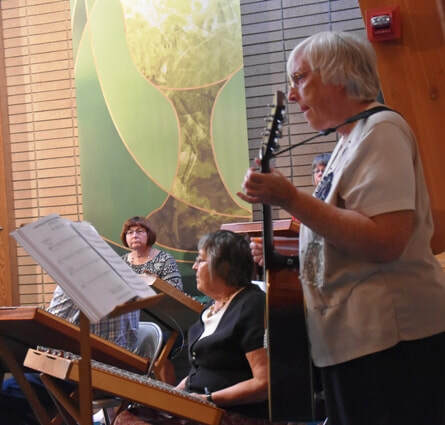 The Second Street Strings, a Defiance area dulcimer group, provided beautiful music throughout the evening. TV-26 Northwest Ohio Hometown Television will rebroadcast the program at 6 p.m. on Mondays, Wednesdays and Fridays and at 3 p.m. on Sundays through Sunday, October 21. To watch last year's Candlelight Vigil program, please click on this link: https://www.youtube.com/watch?v=wXsntYrGU2M. Thanks to the Archbold Samuel Mancino's restaurant for making NAMI Four County its Monday charity recipient on September 24, our chapter gained more than $750. 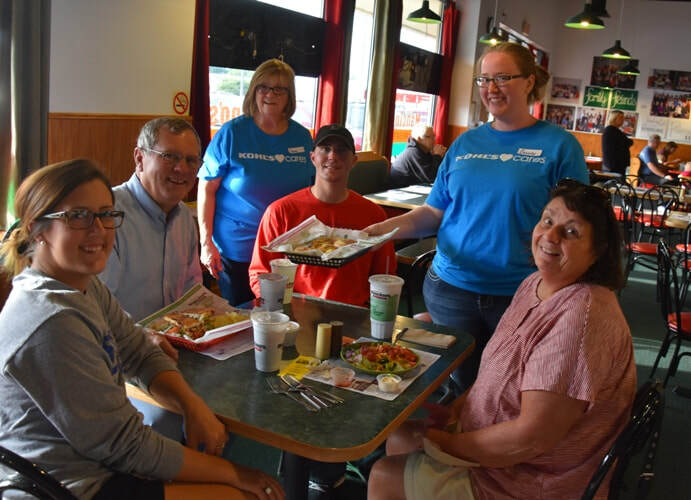 Pictured above is Katie Beck (front) who served as our greeter during the dinner shift with seven Kohl's associates from the Defiance store who helped serve, clean tables and wash dishes, and a Mancino's employee. The store donated 10 percent of all of its sales during the day to NAMI Four County ($222), we sold $57 worth of quilt raffle tickets, received $9 in tips and the Kohl's corporate office will give our chapter $500 since more than five of its employees helped at our event. Other NAMI members who helped during the day were Todd Ziegler, Rene' Levy, Mark Krieger, Dave Durham and Lou Levy. More photos from the fundraiser can be found by clicking on the "Fund Raisers" button on the left side of this page. Fortunately, NAMI's summer picnic was held indoors at the ADAMhs Board office where it was air conditioned and dry. However, those arriving a little late were greeted by a down pour that later gave us a vivid, complete rainbow to enjoy. A wonderful selection of food brought by those attending complemented the grilled hot dogs and ice cream that was provided. Our next social event will be our annual Holiday Party potluck on Thursday, December 6 at the Scout Cabin in Archbold's Ruihley Park. In addition to a delicious meal, we'll enjoy a "robber" gift exchange that is always hilarious. Plan now to attend. Below is a slide show from the picnic. Some of the riders in the 2nd annual Suicide Awareness Benefit Ride that was held Saturday, July 21. The ride was organized by Julie Deeds in memory of her husband, Dennis, who completed suicide October 25, 2012. Below, you can't see all of the bikes that were lined up to begin the ride in this photo. A Renewed Mind Behavioral Health is now located in a new office at 1254 South Main Street (US 127), which is at the south end of a plaza that includes Tractor Supply Company and near the Chief Supermarket plaza. The agency provides a variety of outpatient mental health and substance abuse services at Bryan with a staff that includes behavioral health counselors, a nurse, a certified nurse practitioner and a case manager. The Bryan office staff includes (standing from left): Matt Grafton, A Renewed Mind's regional clinical director; Sara Martz, front desk; John Smith, manager of the agency's four county school-based counseling program; Nicole Kuntz, case manager; Suzanne Clark, nurse; and Danyel Parker, certified nurse practitioner. Seated from left are the agency's Bryan behavioral health counselors: Amanda Waldfogel, Michelle Gee, Lisa Michel, and Kimberly Vogel. The phone number of the Bryan office is 419-633-0705. 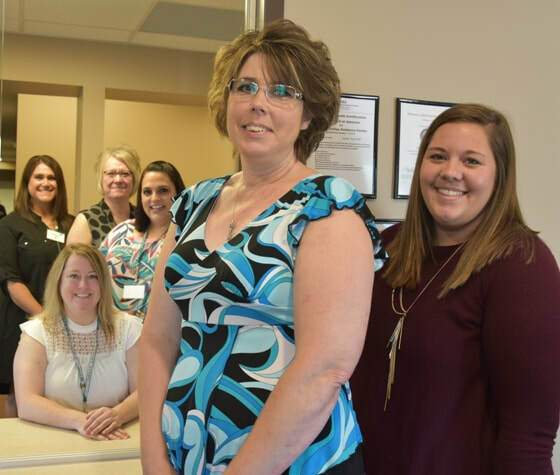 Maumee Valley Guidance Center has opened a new, larger office in Bryan to serve behavioral health clients. The office, located at 910 E. Maple Street, is on Bryan's east side at the corner of Maple and Union streets (near the Valero gas station). 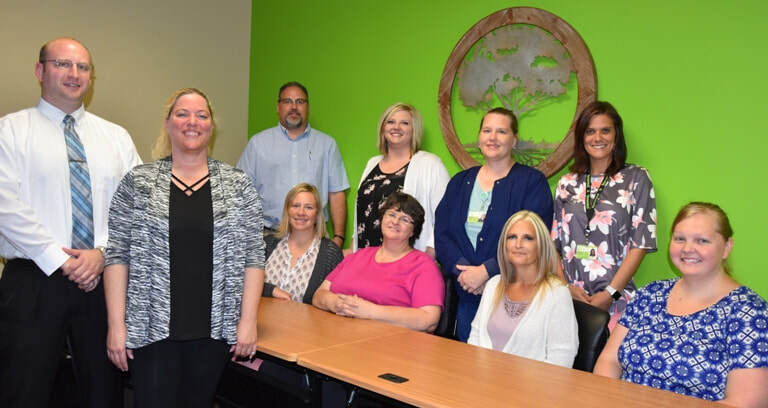 Some of the staff who are ready to serve the community are (back row from left): Rachelle McDonald, case manager supervisor; Jenny Hoeffel, veterans outreach manager; Jasmine Torbet, clinical manager; and Lauri Whiteford (seated), customer service representative. Front row from left are prevention specialists B.J. Horner and Bethany Shirkey. Maumee Valley Guidance Center is a comprehensive outpatient mental health provider serving adults, children and adolescents with offices in all four counties. For a complete listing of the services provided, please refer to the Maumee Valley Guidance Center listing in the "Local Providers with a Sliding Fee Schedule" section. Eight NAMI Four County members attended the 2018 NAMI Ohio state conference the weekend of May 4-5 in Columbus. The theme of this year's conference was "Fulfilling the Promise." The jammed-pack conference included keynote speaker Wil Wheaton, a noted author, actor and producer who talked about living with depression and anxiety for more than 30 years. ​ Other speakers included Cecilia McGough, founder and CEO of the organization Students with Schizophrenia which focuses on empowering college students with schizophrenia, Judge Steve Leifman, a Florida administrative judge known for his efforts to keep mentally ill individuals out of prisons and jails, Emily Robinson, the daughter of a mother with schizophrenia who created a project to document her mother's ups and downs. Friday night entertainment was provided by Robbie Nance, who presented his one person show "That's Just Crazy." ​ NAMI Four County members who attended the conference were Lisa and Tim Holley, Mark Krieger, Lois Pifer, Ed Clinker, Ruth Thind, Julie Schantz and Andrea Knapp. ​ There were also several dozen workshops on a variety of topics that the participants could choose from held on Friday and Saturday. ​ To read Wi Wheaton's keynote address, please click on the "In the news..." button on the left side of this page. ​ Developed by Mental Health First Aid USA, the training follows a five-step plan referred to as ALGEE. ​ Step one: Assess for risk of suicide or harm. ​ Step two: Listen nonjudgmentally. ​ Step three: Give reassurance and information. ​ Step four: Encourage appropriate professional help. ​ Step five: Encourage self-help and other support strategies. The instructors, B.J. Horner and Alma Cerda, were trained by Mental Health First Aid USA to present the material. ​ NAMI Four County has offered free community Mental Health First Aid trainings for four years, originally just an adult version, but for the last two years also adding the youth version. We expect to offer the adult version in the fall. Eighteen parents, grandparents, foster parents, youth-serving volunteers and workers attended the fourth annual training that offers practical and proven management strategies to prevent challenging behaviors in youth -- both children and adolescents. 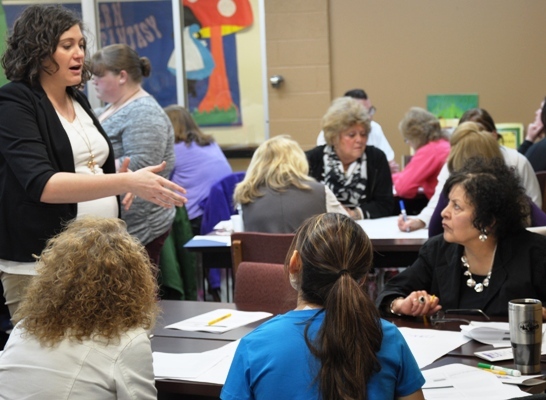 The training was led by Dr. Clarissa Barnes, the director of the Hench Autism Studies Program at Defiance College. ​ The free, 3-hour training was held Saturday morning, April 14 on the Defiance College campus. NAMI Four County would like to thank Dr. Barnes, the Hench Autism Studies Program and Defiance College for making this training possible. Pictured above is Dr. Barnes with two of the participants -- Sharon Upperco and Gary Frazier. More photos from the training can be found by clicking the "Photo & Video Gallery" button on the left side of this page. Ruth Thind as one of nearly 30 NAMI members and friends who attended our annual holiday potluck party in early December at the Scout Cabin in Archbold's Ruihley Park. Our 2018 meeting schedule through spring is posted on this website in our "Meetings" section. Please visit the "Photo and Video Gallery" section for many more photos from our holiday meeting. Twenty-four persons participated in NAMI's final community training of 2017 in early November -- an all-day adult Mental Health First Aid training designed to help them recognize individuals who may be experiencing a mental health crisis. The training reviewed signs and symptoms of various mental illnesses, taught participants how to listen non-judgmentally while giving reassurance and information. The goal is to encourage the individual in crisis to get appropriate professional help and to encourage him or her to seek support and self-help. ​ The training was taught by Billie Jo Horner and Karen VonDeylon, both of whom have completed a week-long training provided by Mental Health First Aid USA. 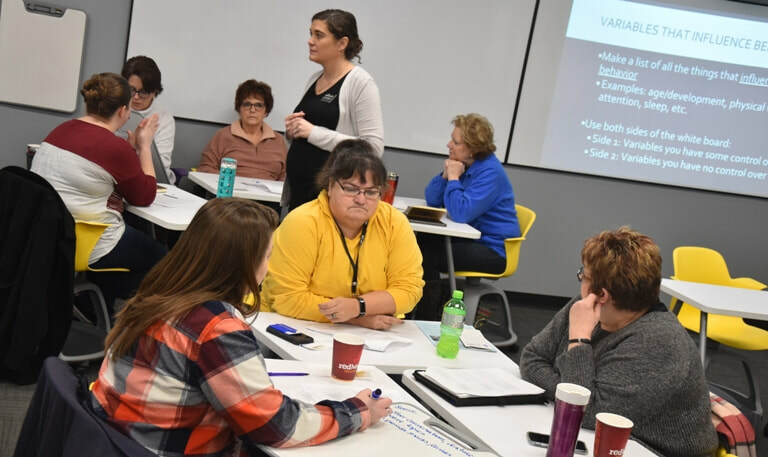 Much of the cost of this training was underwritten by a grant from the Community Hospitals and Wellness Centers in Williams County employee-driven Philanthropy Program. NAMI would like to thank the employees for their generous contribution. ​ More photos from the training are part of a slide show in the "Photo and Video Gallery" on the left side of this page. Tonie Long wins NAMI quilt raffle! Rene' Levy holds the NAMI quilt that she made and donated for this year's quilt raffle. Tonie Long purchased the winning ticket that was drawn at the Spaghetti Dinner, winning the king size, log cabin design quilt. 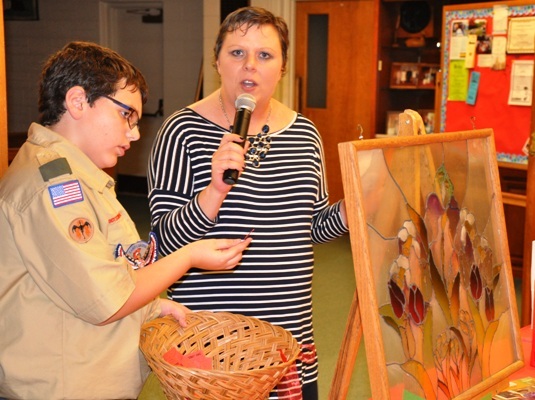 This year's raffle raised $1,226. Rene' has made and donated six quilts for NAMI's raffle. Altogether, the quilts have generated $7,769 for NAMI Four County! Thank-you, Rene'! NAMI treasurer Barb Arnos (left) presents Mary Ann Cready with her 50/50 raffle winnings of $101. Thanks to everyone who participated! Archbold Boy Scouts who helped serve and clean-up were Ben Holley, Jason Klingler, Zac Morris and Ben Morris with Scout leader Tim Holley. Members of Archbold Boy Scout Troop 63 once again helped serve and clean-up after the fundraiser. 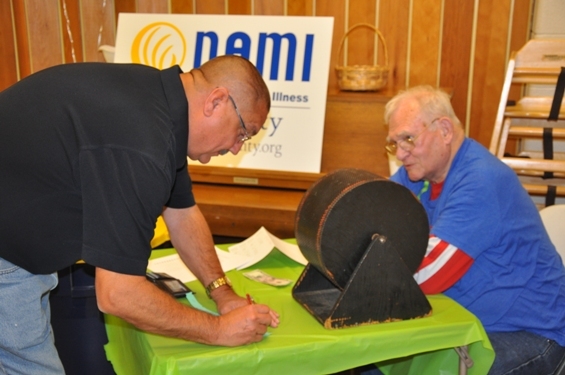 NAMI Four County's third annual Spaghetti Dinner fund raiser was held Thursday, November 2 at the First Lutheran Church in Stryker. In addition to a delicious meal of spaghetti with meat sauce, salad, bread sticks, dessert and a variety of beverages, participants were in a generous spirit -- purchasing tickets for the quilt raffle (which was won by Tonie Long), a 50/50 drawing (which was won by Mary Ann Cready) and a Chinese auction that featured 24 gift packages of donated items from nearly 50 area merchants. ​ A complete listing of the gift basket winners appears below. ​ The dinner raised $5,242 in total donations (sponsorships, meal donations, the Chinese auction and 50/50 drawing). Once expenses were paid, the net profit from the dinner was $4,452.60. Thank-you to everyone who made the dinner such a success! 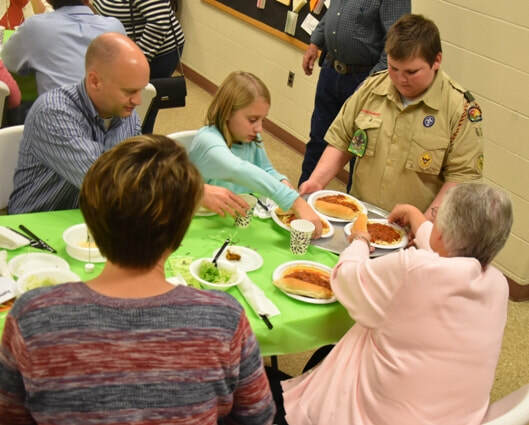 ​ NAMI would like to thank the First Lutheran Church for once again allowing us to use their facility for the dinner as well as Kohl's Associates in Action volunteers and Archbold Boy Scout Troop 63 helping with the raffles and serving during the dinner. ​to see a slide show of our Spaghetti Dinner! ​ NAMI Four County would also like to acknowledge the Sponsors of the Spaghetti Dinner, starting with our Presenting Sponsor -- Newcomer, Shaffer, Spangler and Breininger. Our Gold Sponsors: Averile (Cookie) Lehman, First Federal Bank, Fulton County Health Center, Henry County Hospital and Thrivent Financial. Our Silver Sponsors: Ken’s Furniture, Lori & Rex Robison, UAW, Local 211 and Valko & Associates. Our Bronze Sponsors: Carol Short, Hubbard Law Firm LLC, Lindsey Mickler and Dr. Thomas and Linda Cromwell. ​ Our Food and Decoration Sponsors: Arby’s, Bryan; the F & M Bank; Lange’s Bakery, Archbold; the Meijer Store, Defiance; Stryker Main Stop; Tom and Kathy Foster and Walmart, Bryan. 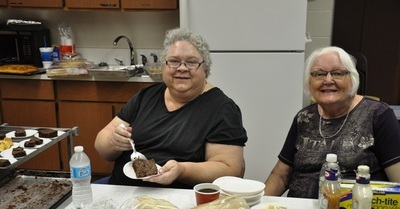 People Donating Desserts and Other Food Items: Lisa Holley, Ruth Thind, Lois Pifer, Wendy Golden, Roger and Sharon Weaver, Barb Arnos, Mary Alice Nagel, Mryna Mitchell, Lucy Ames, Dave Durham, Renee Weaver, Thresa Calvin, Mark Krieger, Gail Sito, Rene’ Levy and Pat Allomong. ​ And, our Chinese Raffle Sponsors: Alysia Miller of AJAV, Bryan; April Stuckey, Scentsy, Stryker; Brent Froelich & Sons Construction; Bud’s Restaurant, Defiance; Buffalo Wild Wings, Defiance; Captain D’s, Defiance; Carol Ann’s City Café, Archbold; Connor Varner, younique, Stryker; Crud Busters, Stryker; Dave and Busters, Toledo; the Defiance Mall; Drena Teague; El Mezcal Restaurant, Defiance; the F & M Bank; Family, Farm and Home, Defiance; Family Video, Bryan; Four Seasons, Bryan; Frisch’s Big Boy, Defiance; Fulton County Health Center Gift Shop, Wauseon; ; Garret Graham & Alicia Buehrer and Grand Plaza, Bryan. Pampered Paws Salon, Defiance; Papa Johns, Defiance; Pea Pod Photography, Archbold; Pettisville Meats; Putt Putt, Defiance; Rita Faye’s Essentials, Evansport; Saavy Dog, Archbold; Sauder Woodworking, Archbold; Sauder Village, Archbold; Shannon Sprague (LMT) at Fountain City Chiropractic & Rehabilitation, Bryan; Skyzone, Toledo; Tanya Fleischmann, Stryker; and Ten Thousand Villages (Carol Short), Archbold. Also: Tim Hortons, Defiance; Toledo Walleye; Trudy Partee, Stryker; Whole Foods for Living, Defiance; and Varsity Club Apparel Co., Bryan. Suzette Leininger: Sauder bookshelf, 2 F & M Bank travel tumblers, $20 Home Restaurant gift card. Beverly Miller: 2 one-day admissions to Sauder Village, Wauseon history book and wall hanging from Fulton County Health Center gift shop. Sue Miller: Dozen donuts from Tim Hortons, 2 dinners at Captain D's, 2 large one-topping pizzas from Papa Johns. Rob Giesige: Dozen donuts from Tim Hortons, $20 Kissners Restaurant gift card, 2 large one topping pizzas from Papa Johns. Beverly Miller: One dozen donuts from Tim Hortons, $20 gift certificate for Ten Thousand Villages, $15 gift card from Carol Ann's City Café. Brenda Short: Blue tooth audio speaker from Office Partners, $20 gift card for Four Seasons, 2 large one topping pizzas from Papa Johns. Carol Breidenbach: One basic house cleaning from Crud Busters, $25 gift card from Pettisville Meats, $25 gift card Frisch's Big Boy. Carol Breidenbach: One basic house cleaning from Crud Busters, 60 minute massage by Shannon Sprague LMT. Kevin Beck: $25 gift card Defiance Mall, 60 minute massage by Shannon Sprague LMT. Patrick Blad: $150 gift certificate to Pea Pod Photography, $20 gift certificate to Grand Plaza Mexican Grill. Tom Foster: Sleep2Go pillow from Ken's Furniture, $30 gift certificate Kircher's Flowers, $20 gift card to Bud's Restaurant. Carol Breidenbach: Toolkit from Lowe's, Lantern from Family, Farm and Home, 2 large one topping pizzas from Papa Johns. Casey Wilcox: 2 free Putt Putt rounds, family fun pass at Skyzone, 1 large one-topping pizza from Papa Johns. Sue Miller: $25 play card to Dave n Busters, $20 gift certificate to Buffalo Wild Wings, 1 large one topping pizza from Papa Johns. Tim Holley: 2 Toledo Walleye tickets, $20 gift card to Varsity Club and t-shirt, 1 large one topping pizza from Papa Johns. Jeannie Hicks: Savvy Dog gift basket, $30 gift card to Mezcal Restaurant, 1 large one topping pizza from Papa Johns. Joni Lashaway: Pampered Paws gift basket, $10 gift card to Jerseys, 1 large one topping pizza Papa Johns. Kelli Creighton: Incense & Essential Oil from Food for Living, Lipsense starter kit from Kelly Sullivan, purse from Drena Teague. Brandi Nafziger: Rita Faye's essentials gift basket, necklace from Trudy Partee, $20 gift card from Alysia Miller at AJAV Salon & Spa. Todd Ziegler: Hair and spa gift basket from Drena Teague, bracelet by Tanya Fleischmann, purse from Drena Teague. Lisa Irwin: Scentsy from April Stuckey, Younique from Conner Varner. Kelli Creighton: Lego activity table made by Alicia Buehrer and Garret Graham, blue happy birthday gift basket made by Lisa Holley. Todd Ziegler: Pink baby blue blanket and hat made by Jackie Briskey, pink happy birthday gift basket made by Lisa Holley. Lois Pifer: Corn hole set made by Brent Froelich & Sons Construction and Adam Froelich. 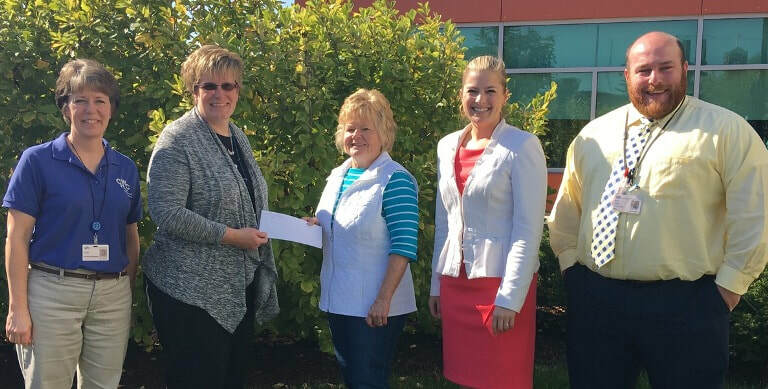 The Community Hospitals and Wellness Centers Employee Driven Philanthropy Program has awarded NAMI Four County a $500 grant to underwrite the cost of the November 9 Mental Health First Aid training. Making the presentation (from left) are Julie Hausch and Cynthia Seaman, both members of the CHWC employee group; Barb Arnos, NAMI treasurer; Katie Rakes, president of the NAMI board of directors; and Ben Fiser, MIS director for CHWC and a member of the NAMI board of directors. The grant will largely cover the cost of the all-day training, which is offered at no cost of participants. It is designed to help persons who work or volunteer in helping professions or human resources identify adults who may be experiencing a mental health crisis and assist them in getting the professional help that they need. The training will be held at St. John's Christian Church in Archbold. Space remains for a few more participants. For more information on the training and how to register, please click on the "Classes" button on the left side of this page. NAMI thanks the hospital employees for their generous gift to support this important training! 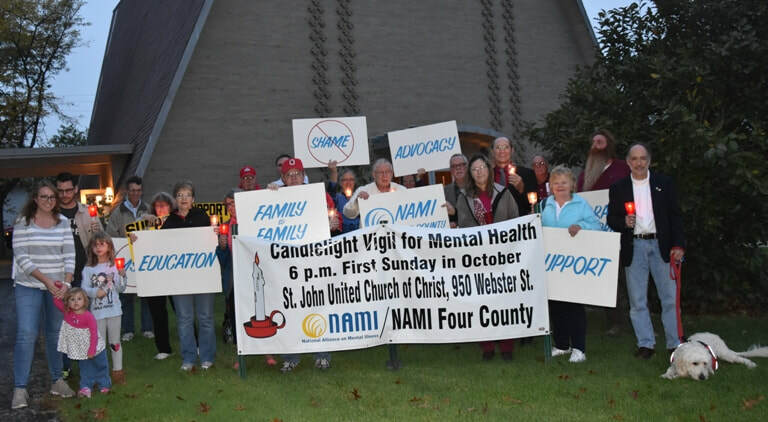 NAMI Four County held its 18th annual Candlelight Vigil program and walk to kick-off Mental Health Awareness Week -- the first week of October. Speakers at this year's program included from left: Matt Rizzo, president/CEO of A Renewed Mind Behavioral Health; Dustin McKee, NAMI Ohio policy director; and Sharon Weaver, Family to Family mental health education class teacher. At the far right is Katherine Rakes, president of the NAMI Four County board of directors. Pastor Joe Payne from St. Paul United Methodist Church also spoke, but is not pictured above. 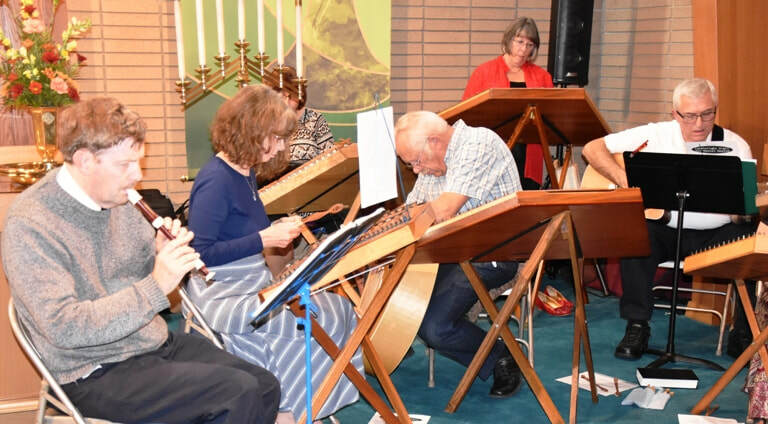 Below are musicians with the Second Street Strings, a dulcimer group that also participated in the program. And, the bottom photo is from the walk. To view the program, you can use the following link: https://www.youtube.com/watch?v=wXsntYrGU2M. The program is about 61 minutes long. ​ More photos from the Candlelight Vigil have been posted as part of a slide show on this website. The slide show can be found by clicking the "Photo and Video Gallery" button on the left side of this page. 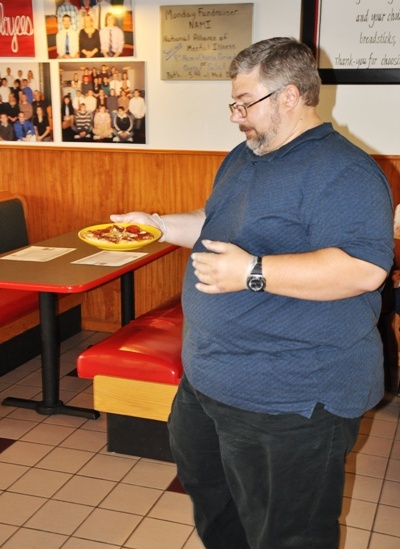 NAMI Four County was the recipient recently of a Mancino's Monday fund-raiser where the Archbold restaurant gave 10 percent of its sales to NAMI. 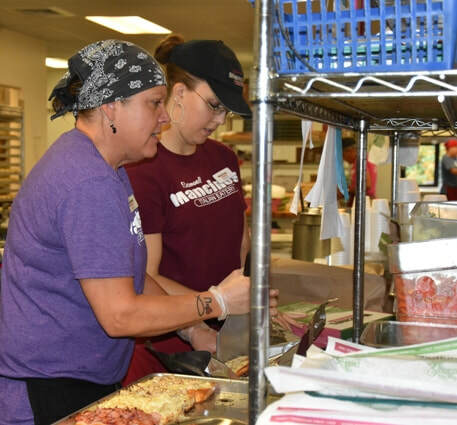 Kohl's employees helped serve, clean tables and wash dishes during the dinner shift to earn NAMI $500 through the corporation's Associates in Action program, and Mancino's customers purchased $133 worth of quilt raffle tickets. Some $868 was raised to support NAMI's free family and community education programs. Thanks to all who helped during the fund-raiser as well as Mancino's Restaurant and the Kohl's employees! 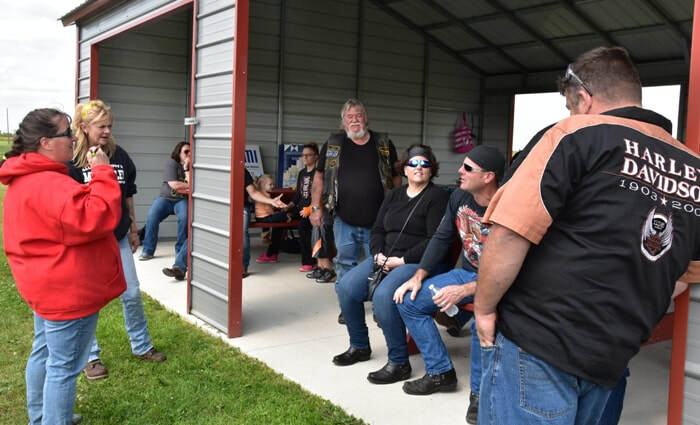 A motorcycle ride to benefit NAMI Four County was held Sunday, September 10. The ride was organized by Julie Deeds (bottom photo, second from left) and her son, Justin (top photo on the left), in memory of Julie's husband and Justin's dad who completed suicide five years ago. The 58 mile ride from the York Township Park to Ridgeville Corners, Independence Dam State Park, Florida, Napoleon and Liberty Center raised $325 for NAMI. This was Julie's first time organizing a ride and she plans to get started earlier next year with a goal of raising even more money for mental health awareness and suicide prevention. Thank-you, Julie and Justin! 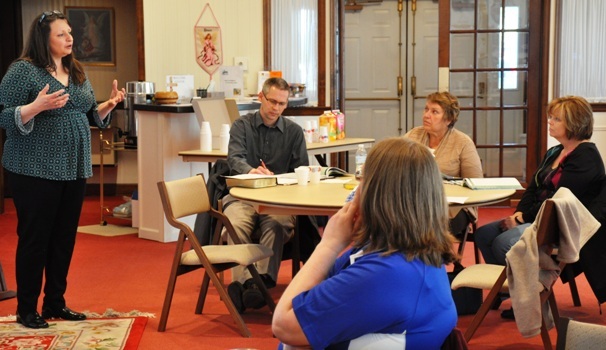 Wendy Golden, left, and Lou Levy recently made a presentation to nine members of the St. John Lutheran (Defiance) Stephen Ministry on mental health and the free classes and other programs that NAMI provides to the community. 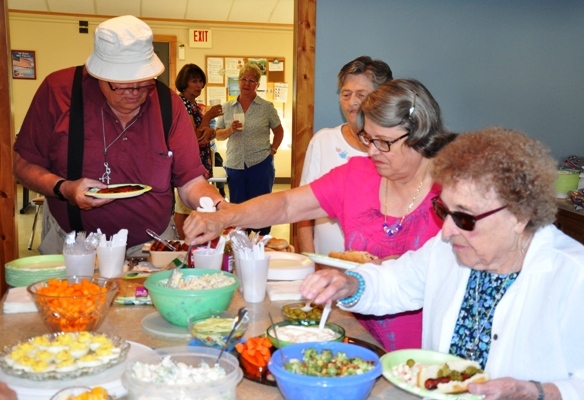 Nearly 30 persons enjoyed a wonderful potluck picnic and fellowship at NAMI's annual picnic in August. The picnic was held at the Scout Cabin in Archbold's Ruihley Park. This year, we also celebrated the 100th birthday (on July 17) of Sharon Weaver's mother, Violet. A photo of Violent with Sharon and Roger Weaver and Eileen Leach is in the photo album section. 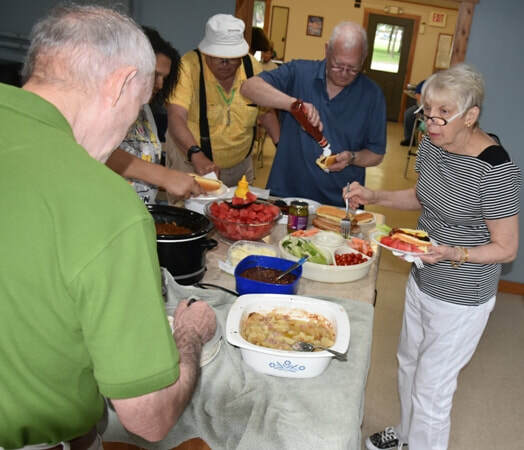 The meal included grilled hot dogs, a variety of baked beans, a hot German potato salad, numerous salads, lots of tasty desserts, and ice cream. 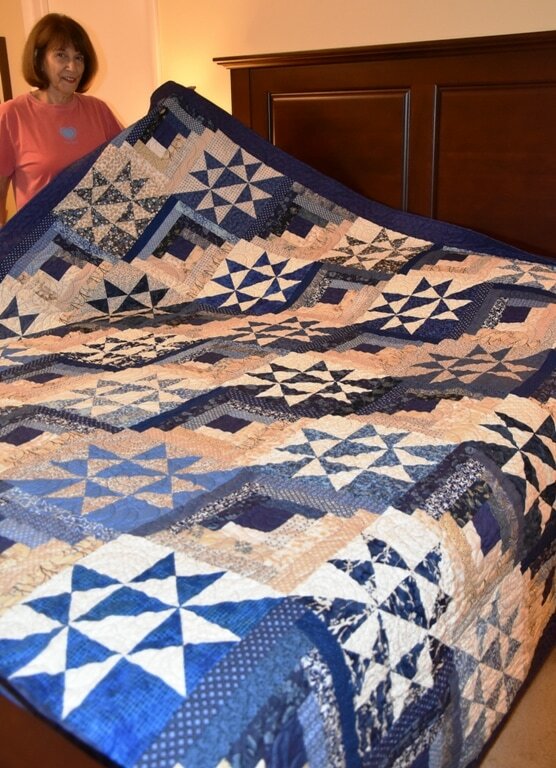 The NAMI quilt (see above story) was on display with more than $100 worth of tickets already turned in. More photos from the picnic are posted in the "Photo and Video Gallery." Just click on that button on the left side of this page. ​ Thirty persons participated in the Youth Mental Health First Aid training sponsored by NAMI in May. The participants came from a variety of social service type backgrounds with a common interest in learning how to assess youth who may be experiencing a mental health crisis and then knowing how to help them get the appropriate professional care. 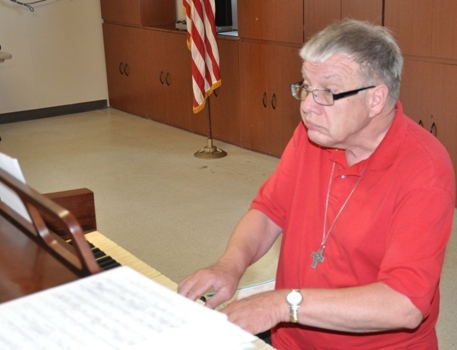 ​ This year's class included persons who work with youth and families from the faith community, boards of developmental disability, family court, juvenile probation, schools and pre-school programs, and shelters. ​ Alma Cerda and Karen Tuck, both of whom have completed a week-long training, were the instructors. More photos from the training are posted in the Photo and Video Gallery. Just select the Photo and Video Gallery button on this page. ​ In the fall, NAMI will offer a day-long adult Mental Health First Aid training. At this point, the date has not been set. Fourteen law enforcement officers from nine different departments graduated from the Spring CIT training that was held the last week in April. This was the 8th training that the Four County ADAMhs Board has coordinated over the last seven years. A total of 116 law enforcement officers from area police and sheriff departments as well as probation and corrections officers have been trained in techniques that have been proven effective for de-escalating crisis situations involving mentally ill persons. In many cases, the assertive skills that they were taught while training to become police officers will actually make a crisis involving a mentally ill person worse. ​ The CIT program was developed a number of years ago by the NAMI affiliate in Memphis, Tennessee and the Memphis police department following a tragic incident involving a mentally ill person. Today, the program is widely used to teach police how to safely and humanely handle calls that involve someone who is mentally ill.
​ NAMI Four County works with the local class to provide panelists and honorariums for family members and persons who have a mental illness to explain how their illnesses affect their behavior and how they respond differently when they are in a crisis due to their illness. Spring 2017 CIT participants from Defiance and Williams counties. Front row, from left: Defiance Police Department Detective Matt Skiver, Patrolman Jordan Vetomskie and Patrolman Frank Herbert. Back row, from left: CIT training coordinator Drena Teague with the Four County ADAMhs Board, Montpelier Police Department chaplain Richard Blank, Stryker Police Department Sgt. Steve Mendez, Montpelier Police Department Sgt. Jennifer Hern, Pioneer Police Department Patrolman Jason Sprague, and CIT instructor Leslie VanAusdale with CCNO. Spring 2017 CIT participants from Fulton and Henry counties. Front row, from left: Henry County Sheriff Department Sgt. Marc Ruskey and Deputy Nick Rasey, and Napoleon Police Department Patrolmen Pat Lannan and Nick Evanoff. 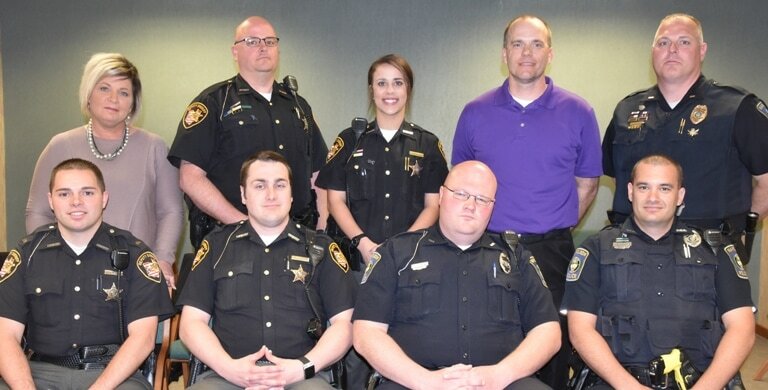 Back row, from left: CIT instructor Brenda Byers with Recovery Services of Northwest Ohio, Fulton County Sheriff Department Deputies Chad Hayward and Alexa Schaffner, Fulton County probation officer Shane Chamberlain, and CIT instructor Lt. Dave Mack with the Napoleon Police Department. For the third year, NAMI Four County and Dr. Clarissa Barnes, director of the Hench Autism Studies Program at Defiance College partnered to offer a free, three-hour workshop to help youth-serving volunteers and staff learn effective behavior management strategies that can promote positive behavior and discourage challenging behavior. 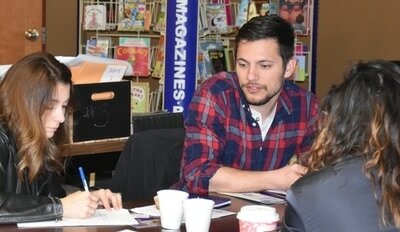 ​Participant evaluations noted that the workshop was very helpful. 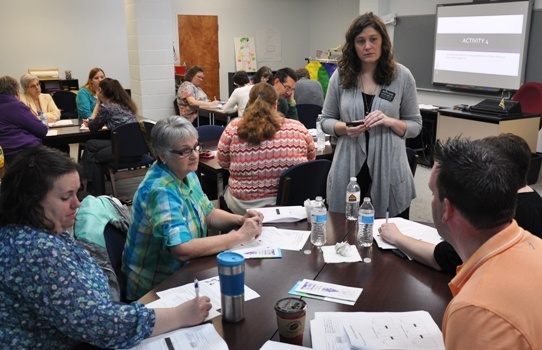 One person wrote: This training was a great addition to what we do and a great resource for professional development. ​Below are a few photos from the workshop. More are posted in the Photo Gallery. Just click on the "gallery button" on the top, left side of this page. Five staff members from the Ridge Project participated. 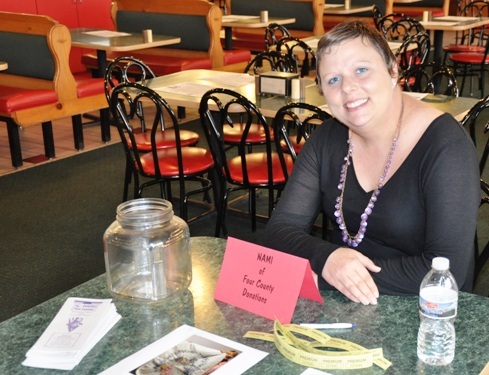 Clarissa Barnes, director of the Hench Autism Studies Program at Defiance College. The S.A.D. time of the year is now. People living in our part of the country are more likely to suffer from mild to severe depression during the months of November, December, January, February and even March than people who live farther south -- say in Florida, Texas or the Southwest. The reason: The shorter days of late fall and winter that tend to be cloudier and provide less sunshine, which causes the brain to produce more of a chemical called melatonin. ​ This, in turn, is believed to cause symptoms in the part of the brain associated with mood -- symptoms that are typical of depression. For example, the estimated prevalence of S.A.D. 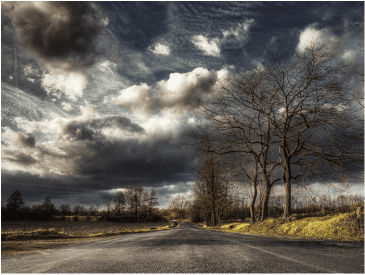 (seasonal affective disorder) in southern Texas and Florida is about 1.5 percent of the population, while in our part of the country it is 8 percent. So, what should we do to lessen the impact of S.A.D.? First, take advantage of sunny days when they occur by dressing warmly and going outside to take a walk. Or, if you don't want to go outside, invest in something called a light box that produces light indoors that is far brighter than ordinary room lighting. Sitting in this light to read or watch TV for an hour or two a day can help. Exercise can also help. If S.A.D. symptoms are severe and begin to affect your ability to do your job or complete tasks that you are normally able to do, or if you lack the energy or desire to do things you normally enjoy doing, then you should seek medical help. You should not simply allow yourself to suffer because of seasonal affective disorder. ​On December 1, NAMI members and guests gathered once again for our annual holiday potluck and party -- celebrating Thanksgiving, Christmas and New Years all in one at the Scout Cabin in Archbold's Ruihley Park. 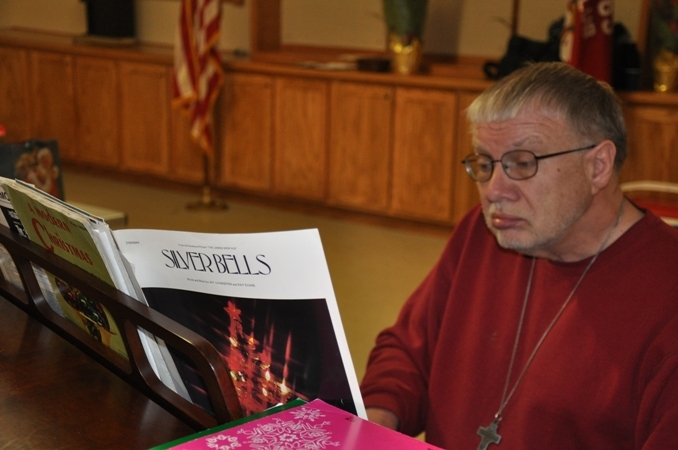 Ed Clinker entertained us with Christmas songs on the piano and everyone shared a carry-in potluck dinner before we started our "robber gift exchange." Afterward, everyone could drive through Archbold's Festival of Lights display in Ruihley Park. ​Congratulations to our re-elected club officers: Dave Durham, president; Sharon Weaver, vice-president; Barb Arnos, treasurer; and Lou Levy, secretary. ​To see additional photos from the evening, please click the "photo and video gallery" button on the left side of this page. Merry Christmas and Happy New Year, everyone! 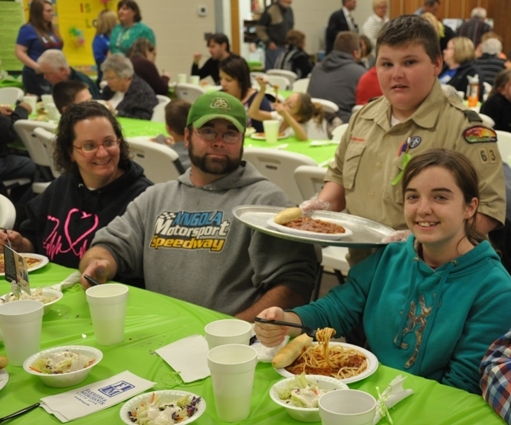 An estimated 200 spaghetti dinners were served at NAMI's second annual spaghetti dinner fundraiser on Thursday, November 10. Once the final donations are in, we expect to net nearly $4,400 on this year's dinner -- an amount that would be double what was made on last year's dinner. A special thank-you to the First Lutheran Church in Stryker for once again allowing us to use their facility for this event. We also had many NAMI members as well as community residents volunteer to help make this fundraiser a success. Thanks to all of them -- especially members of Archbold Boy Scout Troop 63 and Kohl's employees from their Defiance store who participated in their Associate's in Action program. Check back for the final figures from the fundraiser and by Saturday we'll have many photos from the dinner in the "Photo Gallery" section. Basket #1: Ohio State trash can, $25 Pettisville Meats, free oil change from D&M Tire Service Center, an F&M Bank mug. Winner: Barb Arnos. Basket #2: Four passes to Sauder Village, $20 Home Restaurant, $20 Lange’s Bakery. Winner: Lou Levy. Basket #3: Mini-session by LacyMarie Photography, 2 season passes to Williams County Community Theatre, $25 Union Street Grille. Winner: Carol Short. Basket #4: 2 Defiance Movie Theatre passes, $25 Fricker’s, $20 Bud’s Restaurant. Winner: Cookie Layman. Basket #5: NAMI Ohio Umbrella, $25 Varsity Club gift card and shirt, $20 Kissner’s Restaurant, Kircher’s Flowers poinsettia. Winner: Allaina Tracy. Basket #6: Painting by Doug Fiely, Artisan Scarf and Hope Bracelet, Ten Thousand Villages Mug and $20 Gift Card, $15 Carol Ann’s City Café. Winner: Patrick Blad. Basket #7: Alternative Salon’ -- gel manicure with Hannah, half hour massage with Isaiah and hair products from Melissa; $15 Four Season’s. Winner: Brenda Short. Basket #8: Alternative Salon’s -- gel manicure by Kylie, and chemical peel and products from Beverley; Original Cut -- hair products from Teri Woolace; $15 Four Season’s. Winner: Todd Ziegler. Basket #9: Savvy Dog gift basket, 3 free large pizzas from Pizza Hut, free mini blizzard cake from Dairy Queen, $5 Family Video. Winner: Sue Miller. Basket #10: Spangler’s gift basket, 2 large pizzas from Myro’s, free mini blizzard cake from Dairy Queen, $5 Family Video. Winner: Jackie Ordway. Basket #11: Sky Zone family fun pack, $25 Charlie’s Restaurant. Winner: Carol Short. Basket #12: 4 tickets to Toledo Walleye game, $20 Outback Steakhouse. Winner: Lavon Benner. Basket #13: Kindle. Winner: Heather Short. Basket #14: Michigan trash can, an F&M Bank mug, $10 Town and Country, free oil change by Pioneer Quick Lube. Winner: Laura Brown. Katie Beck, one of the four co-chairs of the spaghetti dinner, presents Rob Giesige, the winner of the 50/50 raffle, with $150. Rob then donated $50 of his winnings back to NAMI. Thanks, Rob!! NAMI Four County would like to recognize our sponsors for this year's Spaghetti Dinner fundraiser. Thanks to their support, all of the food, supplies and items that are part of our dinner and raffles have been donated. 100 percent of the funds raised at our dinner will go toward supporting the free community mental health education classes, trainings and support groups sponsored by NAMI Four County as well as our efforts to raise community awareness, understanding and support for families and individuals living with mental illness. Thank-you!!! Gold Level: Anonymous, First Federal Bank, Fulton County Health Center, Kohl's Associates in Action program, Thrivent Financial, and Woolace Electric. Silver Level: Stryker General Store, and Valko and Associates. Bronze Level: Riverside Greens Golf Course. Arbys, Bryan; Edgerton Meats; F & M Bank; Jacoby's Old Smokehouse, West Unity; Meijer, Defiance; Office Max, Toledo; Scrapbook Korner, Archbold; Stryker Main Stop; and Walmart, Bryan. Janet Hitchcock, Roger and Sharon Weaver, Rene Levy, Pat Allomong, Dave Durham, Sandy Myers, Wendy Golden, Barb Arnos, Lois Pifer, Jammie Richmond, Dorothy Beck, Lisa Holley, Ruth Thind, Heidi Foster and Patty Olmstead. Anonymous; Alternatives Salon (Hannah, Isaiah, Melissa, Kylie and Beverley), Bryan; Artisan Florals and Gift Boutique, Bryan; Bud’s Restaurant, Defiance; Carol Ann’s City Café, Archbold; Charlie’s Restaurant, Toledo; D & M Tire Service, Bryan; Dairy Queen, Bryan; Defiance Movie Theatre, Defiance; Doug Fiely; F & M Bank; Family Video, Bryan; Frickers, Defiance; Four Seasons, Bryan; Home Restaurant, Archbold; Kircher’s Flowers; Kissner’s, Defiance; Lacy Marie Photography, Stryker; Lange’s Bakery, Archbold; Michael’s, Toledo; Myro’s, Bryan; Office Partners, Bryan; Original Cut (Teri Woolace), Stryker; Outback Steakhouse, Toledo; Pettisville Meats; Pioneer Quick Lube, Bryan; Pizza Hut, Bryan; Sandy Myers; Sauder Village, Archbold; Savvy Dog, Archbold; Sky Zone, Toledo; Spangler Candy Company; Ten Thousand Villages (Carol Short), Archbold; Toledo Walleye; Town and Country, Bryan; Union Street Grille, Bryan; Varsity Club Apparel Co., Bryan; and Williams County Community Theatre. ​Thirteen people from a variety of backgrounds, including pastors, teachers, victim advocates, law enforcement and other youth-serving volunteers participated in the first Youth Mental Health First Aid training that NAMI Four County has sponsored. The teachers were Billie Jo Horner and Karen Tuck. For more photos, click on the "Photo Gallery" button on the top, left side of this page. ​ Mental illness is a common, costly family of illnesses that affect the brain in ways we don’t fully understand (so there is no cure), but we are gaining insight and developing effective treatments to control symptoms (depending on the illness, symptom management is achieved 60 to 80 percent of the time). At least 20 percent of all adults in the United States will have symptoms of a diagnosable mental illness this year. These disorders of the brain are non-discriminatory. They affect men and women, all racial and ethnic groups, young and old, rich and poor as well as those somewhere in the middle, and all faiths as well as those who profess to have no faith. Mental illnesses, or brain disorders, are medical illnesses. They have a cause (even if we don’t fully understand it), and there are treatments that involve both therapy and medications. Sometimes only therapy is needed, but for most severe mental illnesses medications are also required to manage the symptoms. Sometimes a family doctor can treat the illness (most psychiatric prescriptions are written by family doctors), but many times a specialist is needed. Mental illness is costly. Lost wages total $193.2 billion a year in the United States alone. When treatment costs, reduced productivity and disability costs are added, it is estimated that mental illness costs some $300 billion a year, according to the National Institutes of Mental Health. And, it’s not only a cost in dollars. It is a cost in lives and quality of life as well. In 2004, the World Health Organization released a study on the “Disease Burden in North America.” It combined the effect of premature death with the number of years lived with a disability caused by an illness. Mental illness easily carried the greatest disease burden – greater than cardiovascular diseases and cancer. It found that the disability adjusted years of life lost totaled nearly 9.5 million years for mental illness while the comparable number of years of life lost for cardiovascular diseases was 6.5 million and 5.75 million for cancer. Anxiety disorders are the most common – affecting about 19 percent of all Americans or 40 million people. Anxiety disorders include phobias, post traumatic stress disorder, panic disorder and obsessive compulsive disorder. Anxiety disorders differ from the anxiety most people feel from time to time as disorders are more intense, longer lasting, and interfere with work, activities and relationships. One-half of all persons with anxiety disorders experienced their first episode before the age of 11. Depression affects about 7 percent of the population or 16 million Americans. Women are more likely than men to have symptoms of depression and younger adults (age 18 to 25) are more likely than adults 50 and older to have symptoms of depression. Bipolar disorder affects about 2.8 percent of the population. Although some symptoms are typical of depression, the person with bipolar disorder will also experience episodes of mania, which is the opposite of depression. Treatment of bipolar disorder is different from the treatment used for depression; however, until both depression and mania are experienced an accurate diagnosis cannot be made. The average age of onset of bipolar disorder is 25. Schizophrenia affects about one-half of one percent of the population or 1.4 million people. Typical symptoms might include delusions, hallucinations and withdrawal, among others. Onset in males usually occurs in the late teens to early 20s, while with women it is usually late 20s to early 30s. Emotional, behavioral and mental health issues in children are also common with estimates ranging from 1 in 10 to as high as 1 in 5. The disorders include anxiety, ADHD, autism, eating disorders, depression, schizophrenia and more. For more detailed information on the signs and symptoms of these brain disorders and even more, please visit the NAMI national website at www.nami.org. For information on local treatment resources as well as free mental health education and training programs offered by NAMI Four County, please explore this website. Even though mental illnesses are common, and effective treatments are available to control symptoms, only about 1 in 3 persons with a diagnosable mental illness will ever seek medical help. Instead they needlessly suffer…frequently in silence. Why? Sometimes they don’t know what’s wrong. But many times, they are ashamed to seek help due to the stigma that is still associated with mental illness. 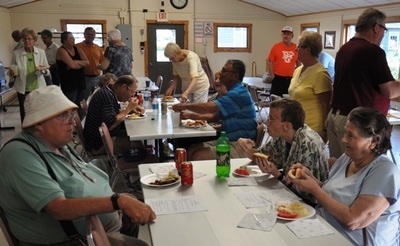 NAMI members and friends who attended our annual picnic in the air conditioned Scout Cabin at Ruihley Park in Archbold had a wonderful time of fellowship, entertainment (Ed Clinker played the piano) and delicious food on Thursday, August 4. Our next social event occurs in December -- our annual holiday party celebration of Thanksgiving, Christmas and New Years. That will be held on Thursday, December 1 starting at 6 p.m. in the Scout Cabin at Ruihley Park in Archbold. The park will be decorated with lots of displays for its free Festival of Lights celebration then. More details on the holiday party can be found in the "Meeting" section of the website and more photos from the picnic can be found in the "Photo and Video Gallery" section of the website. 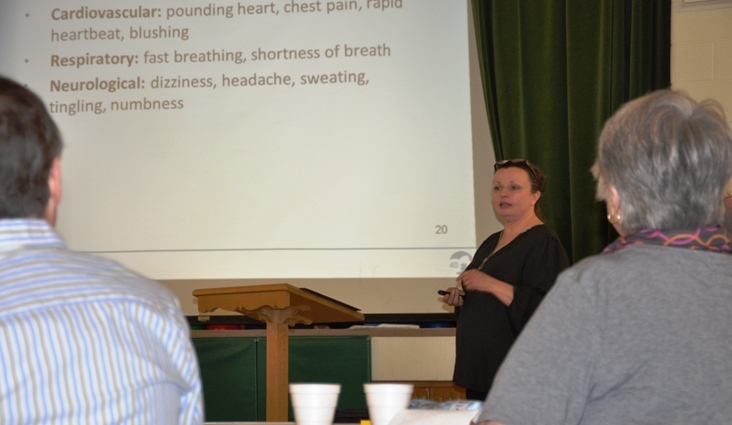 Tonie Long presented the all-day Mental Health First Aid training for 14 participants on April 26 at St. John's Christian Church in Archbold. Among the participants were 6 pastors, 2 county health department workers, a company HR representative and others who volunteer in various capacities for churches and other area organizations. This is the third Mental Health First Aid class that NAMI Four County has sponsored with Tonie Long as the instructor for all of them. ​In order to teach the class, Tonie had to complete a week-long Mental Health First Aid teacher training and commit to providing the class at no cost to community members. She has also been trained to teach a companion class that focuses on Mental Health First Aid for Youth. ​(5) Encourage self-help and other support strategies. ​NAMI Four County would like to thank Pastor Erich Christman and the staff at St. John's Christian Church in Archbold for graciously hosting the training! NOTE: For more photos from the Mental Health First Aid training, please select the "Photo and Video Gallery" button on the left side of our home page (above). Seventeen law enforcement officers from nine different departments participated in this year's CIT (Crisis Intervention Team) training that was sponsored by the Four County ADAMhs Board and NAMI Four County. This is the sixth year that the program has been offered and 90 officers have completed the program during that time. ​The purpose of CIT is to provide education and training for officers on effective ways of dealing with crisis situations that involve someone who is mentally ill. Throughout the week-long training, participants learn about the local mental health system and how persons with a mental illness receive treatment. They also learn techniques that can de-escalate situations as well as understand why some of the methods that have been taught to use in potentially violent situations are more likely to escalate a crisis involving someone who is mentally ill.
​During the training, the officers learn from a panel of persons who have a mental illness as they explain how they act and respond to others when they are not doing well. ​The CIT program was originally developed by the NAMI affiliate in Memphis and the Memphis police department. Today, CIT is taught to police agencies around the country and is credited with safely and effectively resolving a crisis. When family members have to call law enforcement concerning their loved one, they are encouraged to make clear that the person they are calling about has a mental illness and request a CIT officer if the department has one on duty. The 2016 CIT class included participants from the following departments: the Fulton and Williams County sheriff's offices, the Archbold, Defiance, Delta, Napoleon and Swanton police departments, the Corrections Center of Northwest Ohio and the Juvenile Detention Center. Dr. Clarissa Barnes, director of the Hench Autism Studies Program at Defiance College, presented a three-hour training Saturday morning, April 16 that helped 23 youth-serving volunteers from across the four county area understand how to discourage the challenging behaviors that youngsters with ADHD or other autism spectrum disorders can present and promote the positive behaviors that make learning easier for all children in their programs. 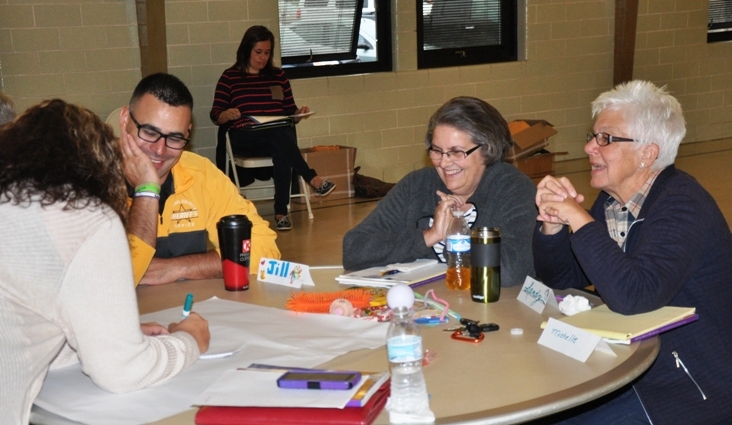 Coordinated by NAMI Four County, the training involved pastors and persons who work in their churches' youth ministries; persons who work in various child and day care programs, including the Defiance Area YMCA; persons who work for area schools; and even grandparents. By the end of the three hour training, Dr. Barnes and two of her students in the autism studies program had helped the participants develop action plans that they could take back to their programs along with the understanding of how to adapt those plans for different youngsters. Here, Dr. Barnes is working with a group from the Praise Church in Defiance. For many more photos from Saturday's training with Dr. Clarissa Barnes, please click on the "Photo and Video Gallery" button on the left side of this page. More than 12 photos are posted on the page. The participants and NAMI Four County would like to thank Dr. Clarissa Barnes, her students and Defiance College for making this informative, helpful training available once again! Nearly 25 NAMI members and guests toured the Bryan Community Health Center as part of our April meeting. For more photos and a short story, select the "Photo and Video Gallery" button on the top left side of our home page. The Bryan Community Health Center, 228 S. Main St. in Bryan (across from Four Seasons Diner) is now open and offering a full range of dental and primary care services. Operated by Health Partners of Western Ohio, the center was originally located in Bryan at the Recovery Services of NW Ohio offices on Van Gundy Drive. There, they provided primary care and operated a federally supported pharmacy. However, the center outgrew the space available there. With financial support from the Four County ADAMhs Board, Health Partners purchased and remodeled the former One Stop Employment office in Bryan and turned it into a medical office. The expanded office space allowed Health Partners of Western Ohio, which operates as a federally qualified health center, to expand their services to include six dental examination rooms where they can provide a full range of dental services, including surgery; expanded pediatric services, additional primary care and behavioral health patient examination rooms, and additional space for their full service, federally supported pharmacy, which is available to patients served by their medical staff. ​The Bryan Community Health Center accepts patients with Medicaid, Medicare and most commercial insurance. They also have a sliding fee schedule. For more information on the services provided at the center or to schedule an appointment, call 567/239-4562. 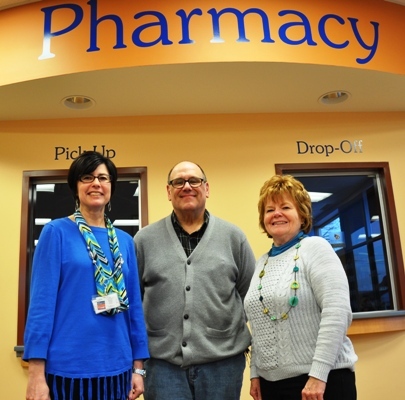 ​Health Partners of Western Ohio also has a primary care office with pharmacy services in Defiance. Their Defiance office is located at Maumee Valley Guidance Center, 211 Biede Ave. There phone number there is 419/785-3827. A full range of dental services are available at the Bryan Community Health Center from Sasha Davisson, DMD, (left) and a staff of dental hygienosts, including Jackie Burt, RDH. ​For more photos of the Health Center and its medical staff, please click on the "photo & video gallery" button at the top left on this page. Now that the holidays and all of the hustle, bustle and flurry of activities associated with them are over and it's time to resume our daily activities, we may experience a post-holiday let-down with stress and depression. Friends and family have gone back to their regular routine and you may have less contact with others. The increased support, warmth and good feelings associated with the holidays are replaced by the cold, cloudy days of winter. So, we need to find things to look forward to and create opportunities to get together with family and friends to ward off or cope with these post-holiday hazards. 2. Invite friends over for dinner, an evening of games or to watch a movie that you've rented... or better yet -- borrowed from the library. ﻿3. Visit someone who is shut-in, someone in a nursing home. It will brighten your day and theirs. 4. Invite your spouse or significant other out for a date and let him or her choose the activities for the evening. 5. Plan a special activity with your children, grandchildren, nieces or nephews. 6. Start a new activity. Is there something you have always wanted to do or learn, but never gotten around to doing it? 7. Go to the library and borrow a book or video. 8. Now that the holiday decorations have been taken down, get some fresh flowers or a plant for the house. It will help brighten your home and your spirits. Additionally, a couple of business items were taken care of at the meeting. We elected officers for 2016. Your officers will be Dave Durham, president; Sharon Weaver, vice-president; Barb Arnos, treasurer; and Lou Levy, secretary. To help Barb until she retires at the end of March, the group appointed Dan Beck, our current treasurer, to serve as assistant treasurer. Thanks to our current officers and those who agreed to serve and were elected for 2016! The key to a successful chapter is for everyone to do what they can, so no one has to do it! NAMI's first ever spaghetti dinner fund-raiser was a success as the event raised $2,289 and nearly 150 dinners were served. The pot for the 50/50 draw totaled nearly $250 and the 10 gift packages in the Chinese auction drew lots of interest. ​Donations for the dinner totaled $1,270, sponsorships totaled $650, ticket sales for the Chinese auction were $246, and the net from the 50/50 drawing was $123. Listed below are the winners of each of the 10 Chinese auction packages. OSU trash can from Office Partners, Archbold Equipment hat and 2 F & M Bank mugs -- Lou Levy. 2 season tickets to the 2016 Williams County Community Theatre, $20 gift card to Pettisville Meats, 4 breakfasts at the Burr House Bed and Breakfast -- Tony and Caroline Gretick. 2 tickets to the December show of the Williams County Community Theatre, $50 gift card for Photos by Erin Armitage, $15 gift card to Carol Ann's City Café -- Lisa Holley. 2 passes to Sauder Village, $20 gift card to The Home Restaurant, $20 gift card to Lange's Bakery, stained glass art donated by Caroline Gretick -- Janice Bruner. Manicure and Pedicure by Kylie Myers, Paul Mitchell gift set donate by Melissa Semer -- Dorothy Beck. Manicure by Hannah Doerhmann, Pedicure by Cindy Milliman, Verb gift set donate by Teri Woolace -- Lisa Smith. $25 gift card from Gerald Grain Center, Farmall toy tractor from Archbold Equipment, Family Video gift package -- Gail Sito. $25 gift card from Gerald Grain Center, John Deere toy tractor from Fred Ott Inc., Family Video gift package -- Ron Cready. Doll donated by Lois Pifer, Savvy Dog gift basket, 8 inch cake from Bryan Dairy Queen, wash bucket and supplies from Bryan AutoZone -- Lisa Holley. Michigan trash can from Office Partners, Archbold Equipment hat, 2 F & M Bank mugs -- Gail Sito. The 50/50 drawing was won by Mark Krieger. Amount won: $123. 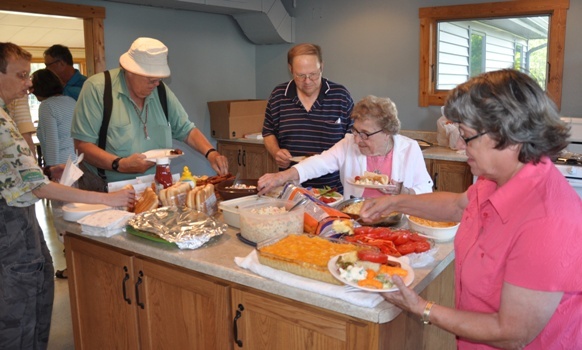 NAMI Four County would like to thank the First Lutheran Church in Stryker for allowing us to use their kitchen and fellowship hall at no cost. We would also like to thank Archbold Boy Scout Troop 63 (pictured at right) for helping serve and clean-up. They were wonderful! Thanks to all of the NAMI and community members who donated desserts for the meal. All left-over food products (spaghetti meat sauce, spaghetti, lettuce for salad, salad dressing, bread sticks, and desserts) were donated to The PATH Center, a homeless shelter and soup kitchen located in Defiance. Betty, The PATH Center cook, was thrilled and thankful to receive the donation. So, everything given to our spaghetti dinner event either went to help our NAMI chapter serve families and individuals dealing with mental illness or to help feed the homeless and others at The PATH Center. Our event sponsors were Valko and Associates, Cookie Lehman, and an anonymous donor. Dinner ​​sponsors who donated all of the products for the meal are Arby's Restaurant, Brookview Farms, Tim Hortons, Stryker General Store, Walmart, Meijer, Farmers & Merchants State Bank, Stryker Main Stop, and NAMI members: Roger and Sharon Weaver, Janet Hitchcock, Gary and Barb Arnos, Willie and Bridget Pack, and Tom and Kathy Foster. Auction sponsors who donated one or more items for the Chinese auction include Autozone in Bryan, Family Video in Bryan, Williams County Community Theatre, Alternatives Salon in Bryan (Kylie Myers, Hannah Doehrmann, Melissa Semer and Cindy Milliman), Original Cut in Stryker (Teri Woolace), and Erin Armitage Photography. Other auction sponsors: ​​Dairy Queen in Bryan, Farmers & Merchants State Bank, Sandy Myers, Caroline Gretick, Fred Ott, Inc., Gerald Grain, Burr House Bed and Breakfast, Lois Pifer, Office Partners, Pettisville Meats, Home Restaurant, Sauder Village, Lange's Bakery, Carol Ann's City Café, Savvy Dog, and Archbold Equipment. Proceeds from the fund-raiser will be used to support the free mental health education classes that NAMI Four County offers throughout the year as well as other trainings for the public such as the day-long Mental Health First Aid class, a week-long Crisis Intervention Team training for law enforcement personnel that NAMI co-sponsors with the Four County ADAMhs Board, and a 3-hour training for volunteers (church youth leaders, Sunday school teachers, pre-school volunteers, and so on) who work with youth who​ have behavioral, emotional or mental health issues. This three-hour class is taught by the director of the Hench Autism Studies Program at Defiance College. Donations to the spaghetti dinner will also support NAMI's mental health community awareness efforts such as the annual Candlelight Vigil for Mental Health on the first Sunday of October and the printing and distribution of some 20,000 restaurant placemats and tray liners and nearly 4,000 bookmarks every fall just before and during Mental Health Awareness Week. Nearly 50 people attended NAMI's 16th annual Candlelight Vigil for Mental Health on Sunday, October 4 at St. John United Church of Christ in Defiance with more than half of those attending participating in the walk following the program. In the photos below, Ron Hofacker (left), the coordinator, was joined by the four speakers: Valarie Lashaway, a NAMI Basics instructor; Kevin "Squishy" Barber, a professional comedian who uses humor to break the stigma associated with mental illness; NAMI Ohio president Lee Dunham, and Pastor Tim Reynolds from Zion's Lutheran Church in Defiance. All of the speakers talked of their own journey as a family and individually with mental illness as they offered examples of why and how they find hope for themselves and others while living with mental illness. Following the program, most of the group participated in a one mile walk from the church to Clinton Street and around the Defiance College campus. Many more photos are part of a slide show in the "photo and video gallery" section of this website (button on the left side of this page). The taping and broadcasts of the Candlelight Vigil program on TV-26 were made possible once again this year through the generous support of the Four County ADAMhs Board. The program will be broadcast on TV-26 at 9 p.m. every Monday, Wednesday and Saturday through October 24. Or, if you cannot get TV-26 at home you can watch the program any time on your computer from this website. Simply go to the "photo and video gallery" button and scroll down to the video gallery. By clicking on the photo, you will connect to the YouTube link. The program runs just over 52 minutes. Again, thank-you to the Four County ADAMhs Board for making this taping (as well as those from previous years) possible. ​NAMI president Katie Beck accepts a check for $172 from Mancino's Restaurant managers Maigan Dancer (middle) and Pamela Steider. NAMI Four County would like to thank Samuel Mancino's restaurant in Archbold for once again allowing our chapter to be one of their Monday charities! 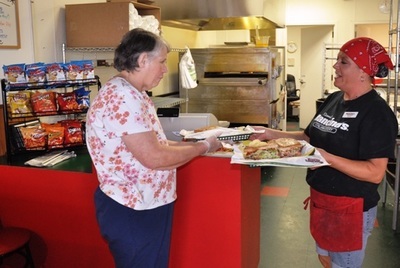 Samuel Mancino's restaurant in Archbold designated NAMI Four County as its charity on Monday, September 28 -- donating 10 percent of all sales to our NAMI chapter. 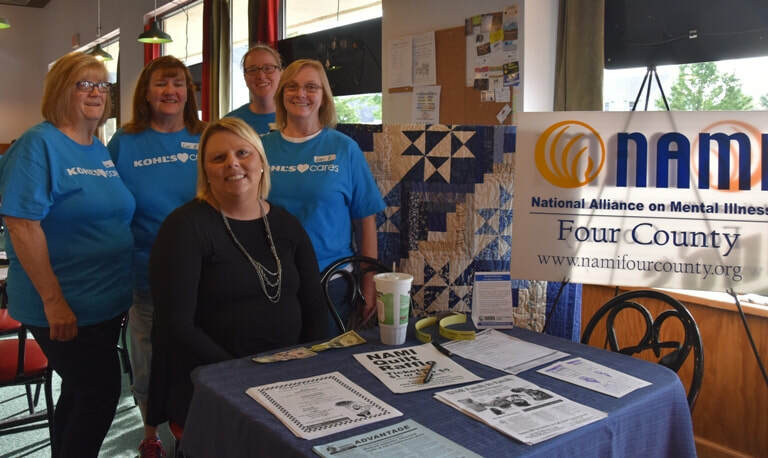 By week's end we learned that Mancino's has donated $172 to NAMI Four County and that we raised an additional $60 in donations and tips and $15 in sales of tickets for our cross-stitch lap quilt raffle. Total raised: $247! Thanks to the following volunteers for helping as either our greeter (Katie Beck for both the lunch and dinner shifts) and as food runners or dish washers: Dan Beck, Mark Krieger, Renee Weaver, Lou and Rene Levy, and Sandy Myers (who also worked the lunch and dinner shifts). Nearly 35 NAMI members and friends attended our annual summer picnic in August at the Scout Cabin in Archbold's Ruihley Park. 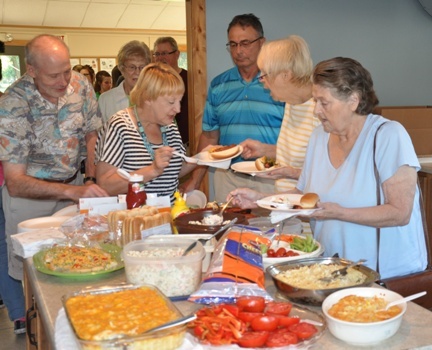 We were joined by the ladies from Serenity Haven for a hot dog roast with a wide assortment of salads, casseroles and desserts brought by those attending. We remembered long-time member Joyce Eberly, who passed away in July, with a moment of silence and especially enjoyed Ed Clinker's piano performance. A -- Assess for risk of suicide or harm. G -- Give reassurance and information. E -- Encourage appropriate professional help. E -- Encourage self-help and other support strategies. All participants received a manual and additional instruction on how to implement the ALGEE action plan. In addition to Tonie, pictured above are Pastor Doug King, Tedrow Mennonite Church; Pastor Dee Custar, Salem Mennonite Church; Lisa Blosser, Community Hospitals and Wellness Center in Bryan; and Marie Ferree, St. Paul's Methodist Church food pantry manager. By the end of the day, all 17 participants were certified as Mental Health First Aiders. 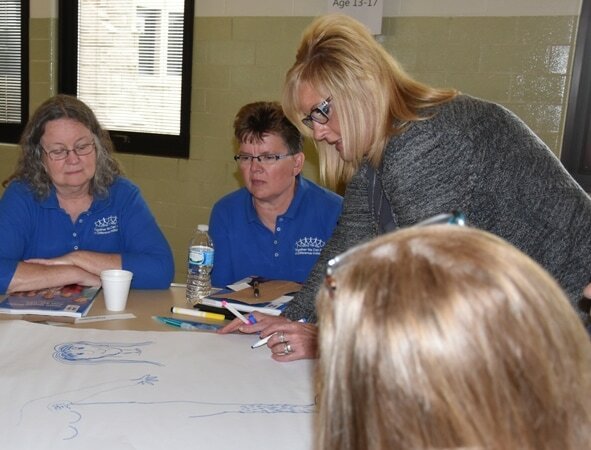 More photos from the April 30 Mental Health First Aid training held at the Archbold United Methodist Church can be found in the "Classes" section. The fifth Crisis Intervention Team (CIT) training team recently completed its week-long class with 16 participants from six area police or sheriffs departments and the Corrections Center of Northwest Ohio and Juvenile Detention Center part of the class. To date, 73 officers from 16 departments or agencies have completed the training. The class, which was developed by the NAMI affiliate in Memphis and Memphis Police Department, is designed to result in more compassionate and more effective officer response to situations involving mentally ill persons. The class was developed following a police response to a mental health crisis call that resulted in the death of a mentally ill person. Ohio has more CIT trained officers than any other state. Locally, the training is co-sponsored by the Four County ADAMhs Board and NAMI Four County. Drena Teague from the ADAMhs Board and a NAMI member coordinates the annual training. 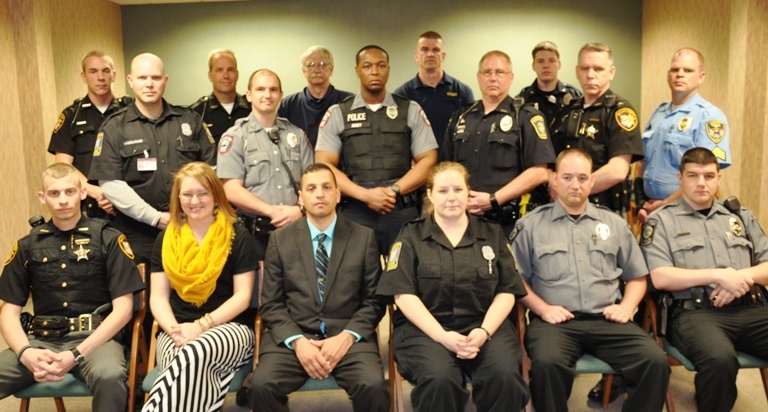 Graduates from 2015 CIT class include (front row from left): Fulton County Sheriff Deputies Josh Rodriguez and Amos Boysel, Swanton Police Officers Anthony Bernal and Zack Shirkey. Back row from left: Defiance County Sheriff Deputy Michael Shock, Drena Teague, CIT training coordinator; Defiance County Sheriff Deputy Gary Plotts, Defiance Police Patrolmen James Wellman, Dan Bostelman and Tim Monhollen, and Napoleon Police Lt. Dave Mack, a CIT instructor. Graduates from the 2015 CIT class include (front row from left): Henry County Sheriff Deputies Ryan Zumfelde and Mark R. Glanz, Napoleon Police Lt. Edward Legg, and Brenda Byers, CIT instructor from Recovery Services of Northwest Ohio. 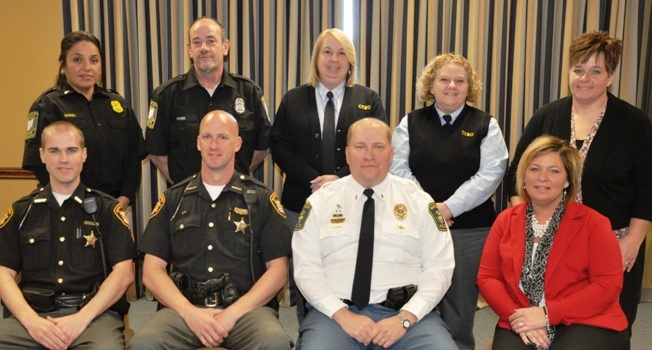 Back row: Juvenile Detention Center Officers Melissa Garza and Richard D. Fifer, Corrections Center of Northwest Ohio Officers Deb Vajen and Judy Masser, and Leslie VanAusdale, CIT instructor from CCNO. Six members of NAMI Four County attended the 2015 NAMI Ohio conference and were on hand when the Affiliate of the Year Award was presented. From left: Mark Krieger, Ed Clinker, Dean Allomong, Lou Levy, Pat Allomong, Karen Lindberg, NAMI Ohio staff, and Terry Russell, NAMI Ohio executive director, and Lisa Holley. Friday's sessions at the conference focused on both the overwhelming cost of housing the non-violent mentally ill offenders in prisons and jails and the need to find more appropriate ways of treating mentally ill persons who commit "crimes of survival" such as stealing food and loitering. Retired Ohio Supreme Court Justice Evelyn Stratton was one of the speakers. From left: Mark Krieger, Lisa Holley, Justice Stratton, Dean Allomong and Pat Allomong. Lt. Dave Mack with the Napoleon Police Dept. was recognized as Ohio's CIT Officer of the Year at the NAMI Ohio conference. From left: Drena Teague, Four County ADAMhs Board CIT training coordinator, Lt. Mack, and Terry Russell, NAMI Ohio executive director. 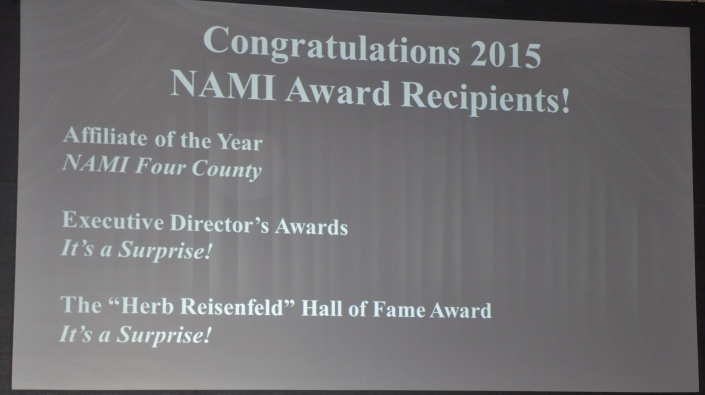 NAMI Four County﻿ was named the NAMI affiliate of the year at the 2015 NAMI Ohio conference on Saturday, April 25 in Columbus. 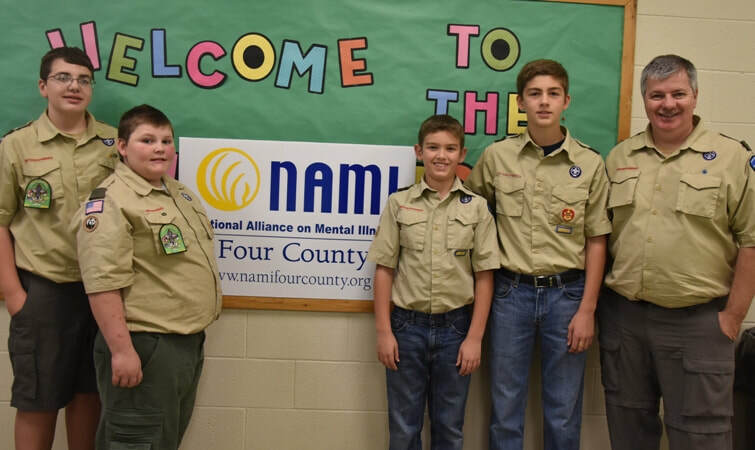 As she made the announcement, Jessica Schmitt (executive director of NAMI Wood County) said that NAMI Four County has made great strides since it was formed in 1998 and overcome the challenges faced by a small, rural affiliate that covers a large geographic area. 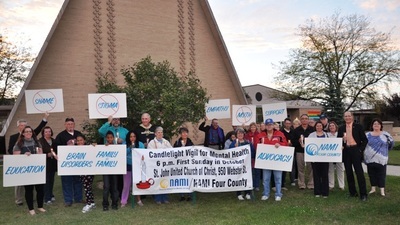 She noted that the chapter has grown from 20 to 30 members during its early years when it offered one Family to Family class a year and held a Candlelight Vigil event for Mental Health Awareness Week to now. Also at the state conference, Napoleon Police Lt. Dave Mack received the CIT Officer of the Year award. It was presented by Ohio Attorney General Mike DeWine. CIT is a week-long Crisis Intervention Team training for law enforcement that was developed by NAMI and is now taught throughout the country with Ohio being one of the most active states in training law enforcement officers on the most effective ways to respond to crisis situations involving persons with a mental illness. Locally, the Four County ADAMhs Board and NAMI Four County have co-sponsored the training for four years. This year's training is April 27 through May 1 and is the largest class ever -- 17 law enforcement officers from across the four county area. ﻿Sixteen youth-serving volunteers from area churches attended a 3 hour training on "Practical Management Strategies to Prevent Challenging Behavior and Promote Positive Behavior" Saturday morning, April 18 at Defiance College. The training was sponsored by NAMI Four County and presented by Dr. Clarissa Barnes, director of the Hench Autism Studies Program at Defiance College. Dr. Barnes (standing in the above photo) was assisted by two of her students: Catlyn Pavel and Noelle Chester. The presentation helped participants describe specific disruptive behaviors that they would like to change for specific youth in the class or activity that they lead, and then consider what request or situation occurred immediately before the behavior as well as the consequence that resulted from the behavior. Throughout the morning, Dr. Barnes explained ways youth activity leaders could begin to modify the indentified behaviors, using examples, discussion and group activities so each participant had a usable action plan they could use. Participant comments included: "Very informative and helpful," "This was an effective, appropriately lay-person centered presentation. A very informative and interesting morning," "I learned some specific things that I can take and use from this morning," and "Great workshop!"